Professor of English Lillian Nayder’s new biography The Other Dickens: A Life of Catherine Hogarth –the first comprehensive portrait of the woman whom Charles Dickens married and then repudiated — is now available online and in bookstores from Cornell University Press. The book explains that after 22 years of marriage and 10 children, Charles pressured Catherine to leave their home, unjustly alleging that she was mentally disordered — unfit and unloved as wife and mother. The novelist’s version of events remains widely held, but Nayder’s book debunks it, demonstrating that Catherine Dickens was a competent woman and her marriage a happy one for much of its duration. Drawing on personal correspondence, banking records and other documentary materials, Nayder has painted the first well-rounded portrait of a figure heretofore known only as “Mrs. Charles Dickens” — a daughter, sister and friend; loving mother and grandmother; capable household manager; and an intelligent person whose company was valued and sought by a wide circle of women and men. Nayder also offers new insights into the relations among the four Hogarth sisters, and along the way draws larger lessons about family relationships and the legal and social status of women during the Victorian era. 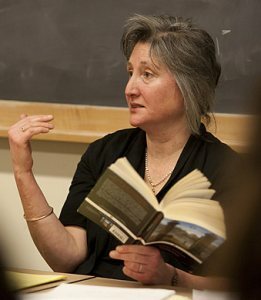 A Dickens scholar, Nayder is the author of Unequal Partners: Charles Dickens, Wilkie Collins, and Victorian Authorship, published by Cornell in 2002. A resident of New Gloucester, she began teaching at Bates in 1989 and is chair of the English department.